ABAP 7.52 SP2. You can explore it and learn how to develop modern ABAP applications with core data services and SAPUI5 or you can get an overview on SAP’s client/server technology. The actual download (in the form of several .rar files), along with more information is available from the SAPStore: SAP AS ABAP 7.52 SP01, developer edition. Short digression: Why has it taken so long? Unlike other vendors, we are not releasing a beta, nor is it a “bare metal” AS. We started with a full 7.52 AS ABAP, SP01 in February. Then we added the technical configuration for convenience (ports, developer and admin users, roles, authorizations). Then we added various pre-configured scenarios: Fiori,SLT, and so on). Then we tested every scenario and menu item in the main role. The whole process undoubtedly took longer than it should. However, to compare a pre-configured, fully tested server with a beta is misleading. OK, rant over 😉 – I’m sorry it took so long. I hope you enjoy it now it’s here. I have also started compiling FAQ and Troubleshooting – so if you experience problems, please check there first. Note: Since we now have 9 blogs referring to 3 different versions of the download developer edition, blog comments are becoming unmanageable. In addition, searching through blog comments is very difficult for other users, resulting in many duplicate issues. Please post on the ABAP Development forum : ABAP Development: Ask a Question , using the hashtag #ABAP_Trial. I promise to work through the backlog here, but cannot answer any further blog comments. Just wanted to say that I was able to successfully install it on OpenSUSE Leap 15.0 in Hyper-V.
Oooh, interesting. This is not something I have tried. If you want to do a short blog on this, with screenshots, any pitfalls, etc, I WILL publish. The hostname check skip is also not needed anymore. I’ll adjust it sometime soon to be more 7.52 focused. I too successfully installed on OpenSUSE Leap 15.0 on Virtual Box. I had few issues, I tried multiple times. Below are the issues I faced during the installation. Leap 15.0 by default tries to partition the hard disk (like 2 to 3 partitions with max size around 50GB) . Thanks to Fabian Lupa , his link made my life easy for the second try. We should click on guided setup for partitioning – explained well by Fabian. I had trouble in accepting the developer license agreement. I could not navigate back to terminal after the license display. I killed the terminal and did restart installation couple of times. Then I figured out after reading the license, we need to press ‘Q’ which will take us back to terminal where we can type ‘yes’. Unfortunately, because of multiple trial and error trials, I don’t have any screen shots. 1. Good to know that it works with Leap 15.0 too. you saved my life, i was stuck at license agreement. We are thankfull for allowing downloading SAP developer editions. I can say this is really important growing for SAP developer community. Unfortunatelly in the Readme is still the wrong password. It’s not Apll1ance but Down1oad for all users! Aaaargh. Thanks for letting me know, Uwe. I’ll edit the blogs and check the Newbie Guides as soon as possible. I’ll also inform the team obviously. Great work Julie and thanks for doing this. Yes, that link is obsolete. The site pointing to it (“Trials and Downloads”) has now been updated. I’ll fix the PDFs asap. In fact, this is a misprint.It should be SP01. Sorry, I cannot currently edit blogs with my user. Some users have experienced an error downloading: “You are not authorized to download this file” or similar. One user solved this by downloading in Firefox, not Chrome. Can you please try this, if you get this issue? There is no capacity to monitor all blogs for all released versions. I have 2 questions. I currently have a Linux Workstation that has quad core processor with plenty of power and 32 Gig of memory running OpenSuse Leap 15. Is there any advantage to installing this in a VM versus directly on the machine? 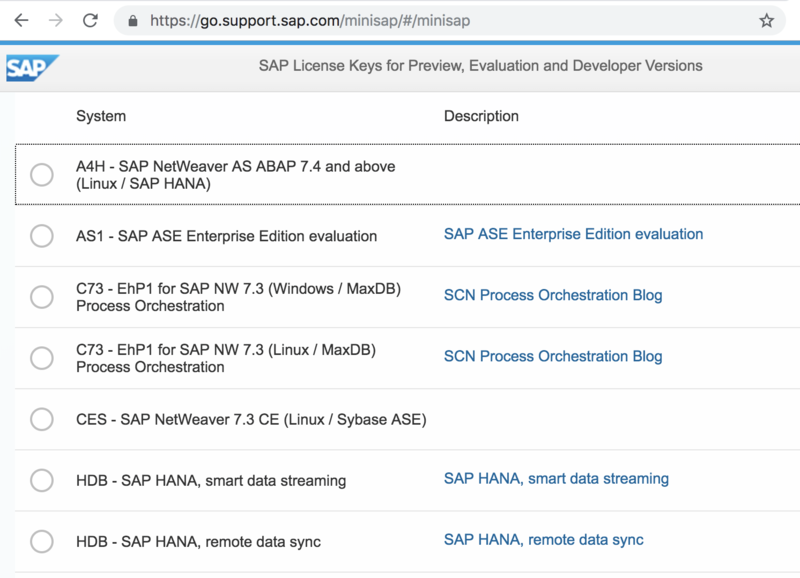 Also will a version of the ABAP 7.52 developer edition be released on SAP HANA in the future like what is currently available for the ABAP 7.51 developer edition. No, there is no real advantage to using the VM. The guide is only for members who are used to Windows, taking their first steps in a Linux VM. Thanks for the clarification. I saw the SAP Netweaver AS ABAP 7.51 SP02 on SAP HANA listed in the Trials and Download list. I guess that I didn’t read it closely enough to see that it was a CAL instance instead of a trial download. I have downloaded the ABAP 752 SP01 and after run command to install, I do not know how to agree the SAP COMMUNITY DEVELOPER License to pass this step. I can not find any button to be clicked or choose. Repeat this for each missing dependency. When they are installed, then run command to install again. I have the same problem and I was successful to solve for libaio. But not for libstdc neither libnsl. I will check with colleagues, but this is actually an openSUSE problem. Can you please post this in the openSUSE forum: openSUSE Forum ? Or check out the SAP on Linux forum: SAP Community SAP on Linux Forum ? Sorry I could not help, but this does not sound specific to the #ABAP_Trial. It is my fault. You can ignore the error messages. Sorry about that. I added “set -o pipefail” to the install.sh and I run “ldconfig -p | grep stdc++”. The result is 137 even though grep finds a match, because grep closes the pipe ASAP, hence ldconfig has no valid file descriptor for writing and dies with SIGPIPE. The proper fix for this awkward issues is to write ldconfig output to a temporary file. It will come with the next download. I was stuck at that too till I desperately hit all buttons on my keyboard. Finally the Q key worked. After you are done reading the Agreement hit the Q Key on your keyboard and it will close the document and present you with the option to accept the agreement. Just hit the Y key afterwards and you should be fine with that. Is there a way to import standard tables like VBAK, VBAP, MARA, etc. in this server? Hi, Arkadeep, You can use a transport request like any other system. However, none of the Suite functions / transactions will be available. I have been trying to import the transactions. But unable to do so. It would be very helpful, if i get some suggestions. The purpose of the AS ABAP developer edition is to enable developers to learn about ABAP language and tools. It is not intended that business content, eg Business Suite transactions or tables, be imported. Sorry, but this is entirely own risk. I was able to get this loaded and it looks great. When trying to create a program, it is asking for a Developer Key. How do we get that key? First : Did you delete all your licenses, before you installed the new one? If so, the developer key is in the table DEVACCESS. You can check this in transaction SE16 -> Table = DEVACCESS . If that fails, open a normal SAP GUI Transaction in SAP GUI – eg SE80. Create a new object (eg data element). Paste the key in there. If you log out and log back in, the key should now work in Eclipse / ADT (!). Thank you. It was strange though, I deleted my Slicense entry even though it was still valid and installed a new one (with same expiry date). Once that was done, I was able to create new objects without any further action.. The Developer key was in the system and worked fine with a new slicense entry. Yes, that’s a peculiarity of the free dev edition. It allows us to save resources, but makes the process less flexible. But when I installed the latest version 7.52 and tried the same the action button to SET_TO_PAID did not appear – I could however execute the action in BOPF test mode but not in the Fioir app. There are MANY more people who can help you there. UPDATE, 2018 Dec 18 : Either that, or the example files have been removed. Sometimes this happens. I am sorry, but that is a limitation of the fact that it is free. I apologize for the inconvenience. Could we please get a link to the ASE license? There are so many links to a sharepoint which does not exist or has expired guest access. So, every time the license location changes, I will simply update the link in this blog. However, PLEASE NOTE: We are currently experiencing Sharepoint issues. Therefore, some users have reported an issue with the Sharepoint link. We are working on this and I will update you all accordingly asap. NW751-SP02 i get the following error Message. This system’s system number is “000000000800291697”, but there is a license key for system number “000000000850319755” in the license key file. Please can you tell me where i can get a corret license for the Hardware-Key 800291697? fixed 😉 I forgot to delete the “old” existing key. Try to Delete the existing license and then install the newly downloaded one. amazing! I cannot even access the page! I just get a blank page, and when i check the debugger tools, it says that the page has some serious issues… anybode an idea, of how to get the license key?? The license renewal page has issue accessing the ‘sap/ui/unified/library-preload.js’ page or the page is not available. Can someone in SAP fix the UI5 page? Thanks for your help. Yes, I am also experiencing an issue with this page. We are not directly responsible for this page. However, I will look into this and get back to you. it worked for me again. I previously tried out several browsers (chrome, mozilla, even IE). Clearing cache etc. It didn’t work out for me. Hope that you will get your license soon! We will continue to look into this. In Chrome, both of these (regular) links work also fine for me, only for mozilla i needed the “debug”-Statement. thank you Julie for putting so much effort on this “ABAP Demo Dev Trial Project” -> I am really grateful for having this oppurtunity! The link, https://go.support.sap.com/minisap/?sap-ui-debug=true#/minisap worked for me. Hi everyone, I just checked the page WITHOUT the debug parameter. It’s working for me, so I’ll consider the issue closed – If you are still having problems, please tell me. I keep getting “Sorry. Your request for information is being reviewed. Once approved, you’ll receive an e-mail with additional instructions.” No e-mail arrives. I’m correctly logged in and have tried on 2 machines and 2 browsers. To add. I finally got an email that allowed me to download file 01. However for all the rest I was not authorised. So it would seem that I now need to wait for an email for each individual file. Seems like a really dumb way to do it. I’ve correctly logged in with my S user. I had to select each file individually and get the popup saying my request was being reviewed. This morning I received 10 individual emails for each individual rar file. When I click the link in the email I can download the related file. However I must click the link in each of the 10 emails for the 10 different files. i.e. if I try to simply return to the main download page to download the files I get the popup again. I’ve never had this happen before. I recently installed the HANA dev edition with no such issue. I have been installing MiniSAP from back in the R/3 4.6 days when it was only available on Linux and never had an issue. Dave Beardall There must be different policies based on region or I don’t know what. From France, I can download the 10 files individually without an email being sent. Let’s wait for Julie Plummer or Community answer. Or maybe you can ask SAP support (there’s a Contact Us button in the support home page). Hi David Metser , Is this the standard procedure in a particular region? It sounds as if something has gone wrong. Thanks for coming back to me. I’m fairly certain I’ve worked out the reason but have not been able to verify yet. In exasperation I registered a new user and was able with that user to immediately download all files without issue. I use a Mac at home with Mojave (latest OS). I had a look in the Keychain app and saw a warning that my SAP S user certificate was invalid. I can only assume that this was the issue but it seems strange that any other SAP activity (such as reading OSS notes) did not have a problem with that certificate. I checked and your comment below is supporting my feeling that there was a glitch in the system with your user. I am not sure who can help but recommend contact the SAP contact person assigning your S user to see if he knows such an issue and knows who to contact. Thanks again Dedi. I’ll follow up. Cheers. thanks for sharing this valuable information, thanks SAP for sharing this developer edition. At some points the installation was a little different than in the documentation. Shall I send you my summary direct or shall I write an own blog about it? What do you prefer? 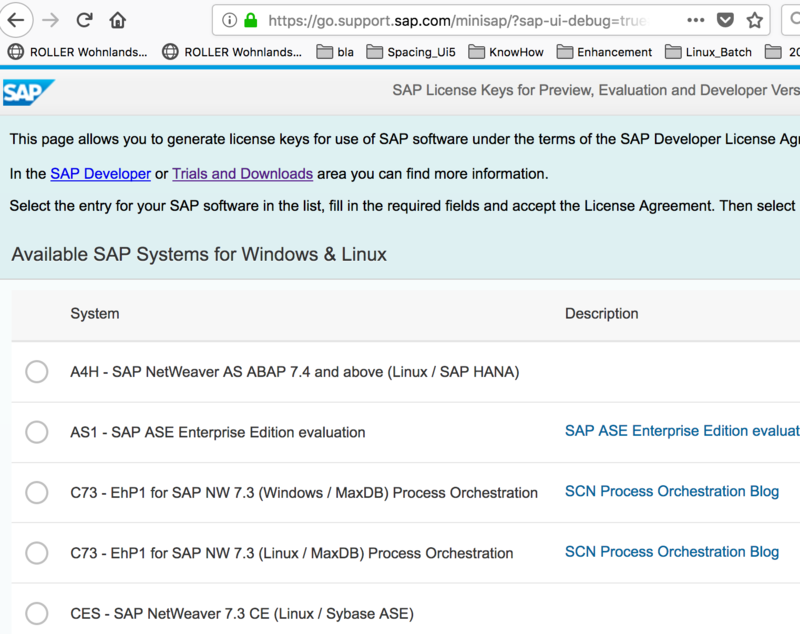 In the last approach i followed the steps of Newbies’ Guide: Installing SAP AS ABAP 7.52 SP01 on Linux – VMWare in detail. I’m running on a Windows 10 Pro Host with 64 bit. Is there a fix available or is something wrong with the latest Linux updates? tmp/sapinst_instdir (The files are all *.log.) Please do NOT send the whole files, just the errors. I need a little help, Its the 3rd time that i repeat the entire process but i have always the same errror, “Error: Could not write into temporary file”. I think that i did something wrong, the third time i use 150Gb insted of 100 Gb but the result was the same ¿Any idea? I guess it happens during ./install.sh – Did you try repeating ./install.sh right after the failure ? – BTW how can we help you if you don’t explain what kind of installation you did (virtual box, vmware, …), or if you opted for any special option during the installation (check the relevant “newbie” guide). More information you give, more help you get. Need your help, I had updated ASE licence to ASE_License_2020. What ABAP release did you install, and what are your installation number and user name? Thank you for your response Sandra Rossi. I was able to create objects after restarting system. Thank you so much : ). Now that we have several blogs, for several product versions, I simply cannot answer any more blog comments. Please post on the ABAP Development forum : ABAP Development: Ask a Question , using the hashtag #ABAP_Trial. I will try to work through the backlog here, but cannot answer any further blog comments.